A couple of days ago, I was deep in my Bible, studying all the places that Jesus talked about Power and Authority -- His and the Father's, and ours. As usual, I always end up back at Luke 10:19, one of the most compelling verses in the New Testament ... Behold, I have given you authority to tread on serpents and scorpions, and over all the power of the enemy, and nothing will injure you (NASB). Depending on the version of the Bible you use, you might read, Listen carefully: I have given you authority [that you now possess] to tread on serpents and scorpions, and [the ability to exercise authority] over all the power of the enemy (Satan); and nothing will [in any way] harm you. (Amplified), OR, Behold, I give unto you power to tread on serpents and scorpions, and over all the power of the enemy: and nothing shall by any means hurt you (KJV). See the differences? The NASB and Amplified versions tell us that Jesus has given us authority over the power of the Enemy. The KJV version says He gives us power over the power of the Enemy. My first question was, are our English translations equating authority and power? Are they the same? When determining what the Bible is telling us, it is not enough to read our modern translations. We must discern the meaning and context at the time it was written. In this case, I wanted to know why "authority" and "power" seemed interchangeable [among the versions] when it came to our rule over the serpents and scorpions; but all versions were in agreement that the rule of the enemy was always called "power". Since there is so much doubt and unbelief in the Body of Christ as to what our spiritual abilities are, it seems important to me to understand the original intent. The power to tread on serpents and scorpions is the Greek word, exousia. It's meaning (not surprisingly) is "authority"... but there's more. That "authority" includes: having been given leave or permission; the ability or strength with which one has been endued (endowed or provided with an ability); the power of authority; the right to exercise power. So this explains why some versions use the word "authority" when it comes to treading on serpents and scorpions, and some use "power". It appears that they are interchangeable. But there is more to this word exousia. It is the power of one whose will and commands must be obeyed by others; the power of rule or government (as in a Kingdom). When used, it implies that which is the subject of the authority or rule -- in this case, the serpents and scorpions. It also conveys the impression of one who possesses authority; a ruler. (In a sense, we can compare the power of our U.S. Ambassadors to represent the authority of our nation, to our power as representatives of God's Kingdom to use the Heavenly power bestowed upon us). So this is what we need to grasp from this particular use of the word "power" as it pertains to us. Jesus has given us His authority -- the same authority given to Him by the Father -- to command the serpents and scorpions to be subject to us. The Greek New Testament tells us as much in Luke 10:20. After telling us we have the authority/power, Jesus goes on to say, "Nevertheless, do not continue to rejoice, namely, because the spirits marshall themselves in subjection under your orders...". Nothing could be clearer! They must do as we command [because we wield the power of Heaven]! 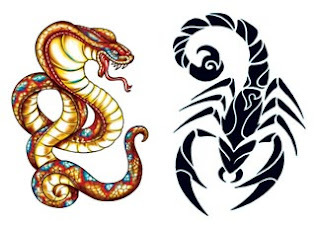 And just what was meant by "serpents" and "scorpions"? Here's what was understood by those who heard Jesus's words: Serpents referred to the characteristics of evil, concentrated in the arch-adversary of God and man, the Devil. It was understood that his characteristics included not only his evil, but his treachery, his venom, his murderous proclivities; the origin, hatefulness and deadly effect of Sin. Those hearing Jesus speak understood that Scorpions produced a venomous sting and pain. The fact that Jesus declared these two to be under our jurisdiction conveyed the thought of our victory [through Him] over spiritually antagonistic forces; the powers and forces of darkness. The Disciples understood what Jesus was telling them! 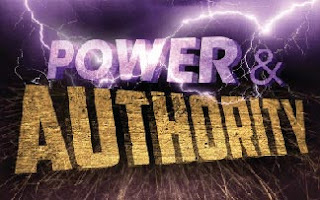 The power and authority was Jesus's, given to the Disciples! The 70 that Jesus sent out even declared it themselves in Luke 10:17 ... “Lord, even the demons are subject to us in Your name.” How frustrating it must be to Jesus to see that His 21st Century Disciples have lost this knowledge... and with it, the power and authority He has given to all who believe in Him [to subdue the spiritual forces coming against them]! But it is important for us, in this Age, to realize that the demons were subject to those early followers of Christ because the Disciples believed! It is not enough for us to try to command the dark spirits to leave if we are just using our human authority as part of our spiritual "medicine cabinet". We must believe that we have the very power of Jesus in us! If doubt and unbelief exist anywhere in your spirit, then your authority or power will have no effect! Now, let's look at the original meaning and context when it comes to our authority/power over the "power" that is the enemy's. Not surprising, this is not the same Greek word, exousia. In this instance, "power" is the Greek word, dunamis. The meaning of this word points to new and higher forces that have entered (and are working) in this lower world of ours; namely, supernatural power. The Holy Spirit possesses dunamis power, and His power is in us. We see that picture in Luke 24:49, And behold, I am sending the promise of my Father upon you. But stay in the city until you are clothed with power from on high.” We also see the this dunamis (supernatural) power in Luke 22:69, But from now on, the Son of Man will be seated at the right hand of the power of God.” This is the supernatural power of Heaven that enabled Jesus to perform signs and wonders. And to no surprise of mine, dunamis is one of the Greek words used to describe "wonders". In fact, "signs and wonders" is defined as "indicating dunamis (supernatural) power". But guess what? Satan possesses "dunamis" power, too. Because the Greek word dunamis also connotes power, strength, and violence, we see the exercise of the devil's "dunamis power" in 2 Thessalonians 2:9, The coming of the lawless one is by the activity of Satan with all power and false signs and wonders. Yes, his miracles will be false, but they are supernatural signs and wonders, nonetheless. But we should not fear! Jesus, Himself, tells us very clearly in Luke 10:19 ... With the supernatural power (dunamis) that He has given us, and the authority (exousia) to use it, we can command [in His Name] that the powers and forces of Satan's darkness (the serpents and scorpions) leave us alone; and furthermore, that power [in us] defeats all the supernatural power that Satan commands! He who is in me is greater than he who is in the world! So can you see how important it is that the modern Church come to the full knowledge and counsel of Jesus and the Father? The Bible tells us that darker days are ahead, and it should be clear, by now, that we cannot defeat the forces of evil under our own power. We must believe that we have been given the abilities and strength of Heaven and the right (authority) to exercise that exousia power by His Name! But that's not all! Our exousia power will defeat Satan's dunamis power because his power is inferior to the dunamis power of Heaven that backs us up. I don't know how many of you have made it this far in reading my post -- you may have quit due to boredom or lack of interest. And to some, this may all seem like a useless exercise in semantics, but until we unpack the original meaning and context of the First Century in which this Scripture was spoken and written, we remain ineffective in our Twenty-First Century doctrine and theology. We will continue in our captivity to Satan's lies, and in our fears and self-doubt. 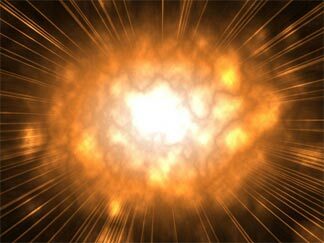 And by not exercising our authority over the power of the Enemy, the Kingdom suffers -- we bear little fruit, we are unable to help Jesus set other captives free, we do not reflect God's glory and power in the midst of all the nations, and we are not readying the earth for His triumphal return. Jesus's words in Luke 10:19 were not only for those 70 Disciples who returned, declaring their victories over Satan's demons. They were meant to inspire all generations that followed. His words were meant for us -- to believe them and to live them! It's time the modern Church began proclaiming its own victories in the Name of Jesus! Matthew 9:8 When the crowds saw this, they were awestruck, and glorified God and praised Him, who had given such authority and power to men. Just want you to know I'm still with you!! I haven't gotten bored nor lost interest. :) My mother's health has declined so she's moved in with me; that with working full-time keeps me so busy. Just wanted to let you know how much I enjoy reading and learning from your posts but I don't have much time to comment. And bless you, Dianna, for honoring your mother and caring for her! You can expect Jesus to say, "Well done, good and faithful servant", when you stand before Him. Glad to know you're still out there and a part of this blog family! I can tell that you understand Luke 10:19 perfectly! Keep blowing the trumpet! The more of us who are shouting it from the rooftops, the better chance the Body of Christ will mature and accept this Truth.